Hannah Galey always has been a standout on the softball field. This summer, the recent Scappoose High School grad is preparing for life as one of many standouts at the University of Oregon. Galey is spending her summer playing for the Northwest Bullets, a traveling team that has entered several of the top tournaments in the nation. This is her second season with the team, but this summer is different. This summer, Galey is focusing on a new position, playing regularly in the outfield for the first time. It is also different because come August she will head to Eugene, joining a highly successful college team as it makes a huge transition. Mike White, the coach who built the Ducks into a national-caliber program, left Oregon this week for Texas. The move means that Galey will play for a different coaching staff than the one that recruited her. The coaching change isn't likely to dampen her enthusiasm for joining the Ducks. "It's definitely exciting," she said, of being a Duck, "especially since the fans are so dedicated to the softball team and there's so many people that used to play there or used to go to Oregon that are so dedicated to supporting the softball team." Galey had her heart set on Oregon for a long time. When the Ducks offered her an opportunity to join their flock, she jumped at the chance — verbally committing to Oregon in the spring of her sophomore year of high school. Wayne Galey remembers asking his daughter if they should wait to see if any full scholarship offers come (college softball programs split their allotted scholarship dollars, with only pitchers, catchers and the occasional top hitter receiving full-ride help). "But she said, 'No dad. I want to go to Oregon,'" he recalled. This summer, her focus is on preparing to be a Duck. Bullets coach Dennis Muir explained that Galey — a shortstop for most of her previous teams — is playing outfield both because her athleticism will help the Bullets compete at elite-level tournaments and because it could turn out to be her best position in college. "I think she needs more experience there because she might end up there at Oregon," Muir said. "They obviously have a lot of good players, so I think giving her that experience is good. And we can use her out there as well." The previous Ducks coaching staff recruited Galey as a utility player, but Muir is confident Galey can succeed for the Ducks. "What jumps out at us as travel ball coaches is her athleticism and her strength and explosiveness. It's hard to find that," Muir said. "When you run above average, your arm's above average and you have an above-average bat ... it's hard to find kids with that many tools." Hannah's earliest memories include going to her dad's slowpitch softball games. Wayne Galey still plays, this summer for a men's senior slowpitch team from the Seattle area. "My dad is by far my biggest influence," Hannah said. "He coached me since the time I started playing and coached me up until I was 15. He has taught me everything I know and was the one who really pushed me to get to where I am going." Hannah's older brother, Kyle, played baseball until he reached high school, and her older sister, Cassie, played at Mt. Hood Community College. But it was Hannah who was introduced to high-level softball at a young age. She was 9 when her Scappoose Little League team qualified for the age 9-10 state tournament. Wayne was a coach on that team. "She had too much talent to stay in Little League, so after that year, we moved on to ASA softball stuff," Wayne Galey said. Playing with and against older girls, Hannah was on four different travel teams before joining the Bullets' under-18 team. Wayne was an assistant coach for most of those teams. He said the college recruiting process started when Hannah was about 13 — and it was challenging. "When we first started the club travel stuff, I don't think college was on my mind. We weren't thinking about it," Wayne Galey said. "She just kept getting better and better and better, so by her first year of 14U, myself and the head coach at that time knew she was going to be a D-I player." Softball has been Hannah Galey's main sport for nearly a decade, though she also played basketball and volleyball. She earned four varsity letters in volleyball at Scappoose, but gave up high school basketball after her freshman year to spend her winters resting and working on softball skills. "Since I was about 10, my summers have been consumed by softball," she said. "I did play volleyball in high school, which I loved. It was so nice to get that break from softball and transition into something totally different and clear my mind. It kind of let me start over for the next year in softball." 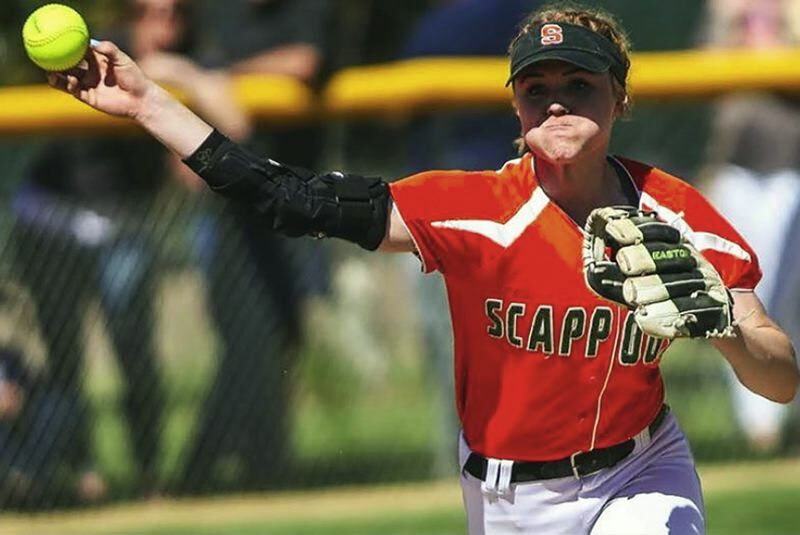 Galey had a spectacular high school softball career at Scappoose. She hit a home run on the first pitch she saw as a high school freshman and hit for the cycle in her debut game on March 16, 2015. Her career batting average was .539 for the Indians. She hit 46 home runs, knocked in 217 and scored 200 runs. Despite getting a late start to her senior season following elbow surgery, Galey batted .556 with seven home runs, 47 RBIs and 40 runs scored in only 87 plate appearances. As a junior and senior, she never struck out. Galey credits Cijay Koler, the Indians' softball coach for her first three high school seasons, for boosting her confidence. "She taught me to believe in myself in a way I never did before," Galey said. "She pushed me and helped me become a better player and person." Koler said Galey was like having an extra coach, in part because her shortstop always focused on the task at hand in practice and in games. One thing Galey did not experience at Scappoose was a state title. The Indians made the Oregon School Activities Association quarterfinals twice and lost to Banks in the semifinals when Galey was a sophomore. Her Scappoose High career ended with a loss to North Bend in the first round of this year's Class 4A playoffs. Her senior season was perhaps her most challenging. Koler stepped down as coach early in spring while Galey was playing her way back after undergoing fall elbow surgery. The procedure removed an extra piece of muscle that was putting pressure on a nerve in her elbow, causing pain and numbness. As soon as the high school season ended, Galey turned her attention to preparing for summer tournaments, in part by traveling to Tualatin several days a week to hit off Muir's pitching machines. "What I'm working on the most right now is getting back used to the speed and movement that you see at this level," Galey said. "These girls are throwing 60 to 70 mph with drop balls and curveballs and rise balls. It's really getting used to seeing that kind of movement and speed. "I think seeing the movement is harder than seeing the speed. Almost no 4A (high school) pitcher really has any movement. They might have a ball that's up, but I wouldn't call it a rise ball. So getting used to recognizing the pitch and knowing if it's going to be a strike or not is really the hardest part of the adjustments." Seeing different pitchers and learning to adjust in the batters' box is perhaps the most valuable experience this summer for Galey and her Bullets teammates — many also bound for NCAA Division I programs. Traveling to invitation-only tournaments, they will face pitchers headed to top programs in the SEC and the Pac-12. The goal is to teach Galey how to make the pitch-to-pitch adjustments required when facing top college hurlers. "When you're the best athlete and you're better than the pitchers every game, you don't have to do that," Muir said. "But when you get the pitchers at this level, they're dictating the game plan and these athletes aren't used to that — they're used to getting their way. "(But) when you have pitchers throwing 65 to 70 (mph) and they're dictating your game play, it's really hard for these athletes to learn how to come up with a game plan." Along with adjusting to tough pitches, the jump from high school and travel ball to Pac-12 softball means also coping with failure. Galey reached base well over half the time in high school. But high school pitchers didn't throw hard, nor did they have the scouting reports on each hitter that college teams have on a regular basis. "The game at this level forces you to change to be successful," Muir said. "Teaching these athletes how to do that, that's what we've worked on the most with Hannah. How do we be uncomfortable and let someone else dictate what I have to do?" Galey knows she faces a challenging adjustment. But she remembers a time, a few years back, when playing softball for the Ducks was only a dream. "Then my dad really pushed me to go to camps and get on these bigger teams and really get looked at by Oregon." Koler is confident Galey will thrive with the Ducks. "I know Hannah will do well at the next level," Koler said. "My advice to her would be to start small. She's used to being one of the best, if not the best, player on the field. She will be surrounded by the best of the best. Use that and learn everything you can."